I remember as a kid I used to watch John Wayne movies with my dad. Most of them were westerns or war movies but one stood out to me called The Quiet Man. The setting of this classic took place in Ireland. I never forgot this movie and often watch it when it’s on it brings back memories of my dad. One recent viewing sparked an idea for the name of a shaving soap I was working on a scent based on Creed’s Green Irish Tweed. It seemed everyone making this kind of scented soap was adding the word tweed in its title so I wanted to be different. I was hoping people would get the reference. The day I released mine I sold out my first batch in 3 days. The packaging for this soap is based on our 4oz tub which is our standard size for wet the face. Were also thinking of 1oz sizes for all of our sample offerings. The label I created depicts a small Irish village with a path that’s just wide enough to allow two people to have a peaceful stroll down. The scene is empty so you can place yourself into it. It just seems to me the perfect setting to spend some time with someone and if you’ve ever seen The Quiet Man movie you’ll get the connection. The scent of this soap is based on Creed’s Green Irish Tweed. This is not a cheap fragrance if your planning on purchasing the real thing I’ve seen it go for as much as $395.00 for 3.4oz. Our scent notes are Sandalwood, Florentine, Iris, Herbaceous Clover, French Verbena, Violet leaves and Ambergris. Originally created for Cary Grant and later worn by Richard Gere, Robert Redford, Prince Charles and Clint Eastwood. Some say it’s simply what a well-dressed man ought to smell like! We finally have our new formula ready to go into production and I have to say it’s amazing. 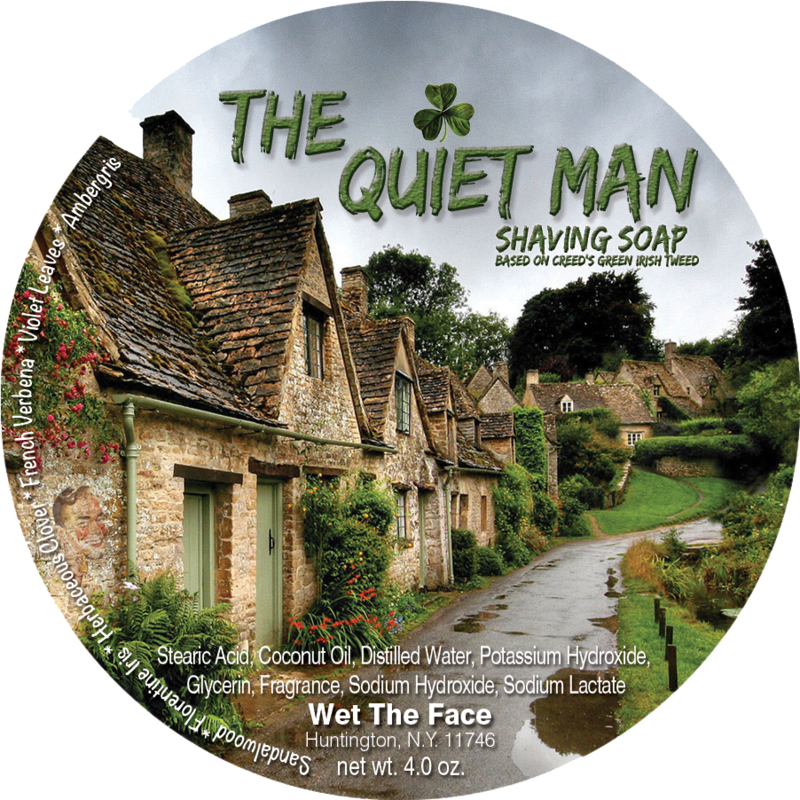 Moving forward all Wet The Face shaving soaps will be transitioning to this release. The reason I bring this up is this soap is a lather monster in less than a min I had so much lather on my brush it almost disappeared. It creates a thick rich creamy lather that really penetrates your beard. The slickness and glide are fantastic allowing you to go over trouble spots without the worry of irritation. My post shave feel was very close and extremely satisfying. 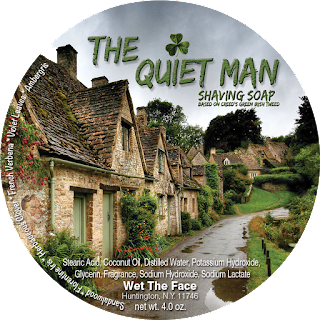 So, it’s not surprising that I would have a great shave with The Quiet Man. I have to say if this article doesn’t peak your interest then please watch the video on my YouTube channel and you’ll see what I mean by lather monster.